As we come to the end of another year at Sir Robert Hitcham’s CEVAP School I would like to take a moment to reflect on what has made up this highly successful year for our school. Our sporting achievements continue to be a talking point with medals and trophies in abundance. The children have yet again excelled themselves at swimming, cross country, hockey and cricket. Musically the children have been involved in the BBC ‘Ten Pieces’, Friday Afternoons at Snape, singing with the Phoenix Singers, performing in Church, at school and in Framlingham. Artistically and dramatically the children have been involved with many competitions both locally and nationally, have performed in front of parents and the local community in a variety of forms, for Year 6 culminating in our performance of ‘Hoodwinked’ at Framlingham College. 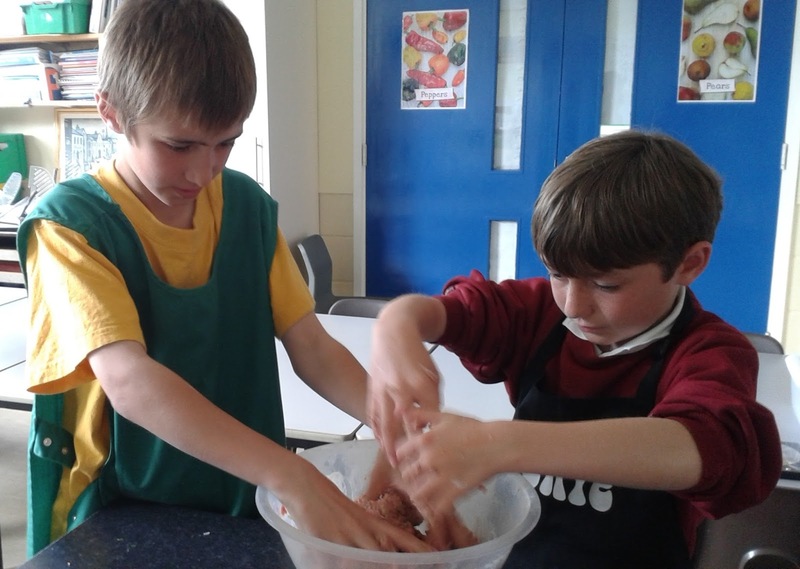 Cookery has been a key theme this year with the opening of our new curriculum kitchen being utilised through lessons and the extremely popular cookery club. Our School Arts Festival this summer was a tremendous opportunity for all children to be given the choice in performing as a group or as solo performers in front of an audience. The quality of the performances was outstanding and despite the weather you were a wonderfully supportive audience and gave it a real festival feel. Due to the positive feedback we have received we intend to run the festival every other year. The involvement in our Festival and the Celebration of Framlingham held at St Michael’s Church gave us case studies for the new Artsmark Award of which we are awaiting news. The Schools Council, Eco Council and the newly formed Worship Group have worked hard this year to help increase everyone’s opportunity to learn. Our House Captains have been very busy organising sports, arts and inter-house experiences and we are very grateful for their contribution to our school. Once again it has been a very positive year for the Parent Council who work hard to ensure communication remains of a high quality and for the ‘Friends’ who work tirelessly to support the school and enable us to give the children opportunities such as the terrific ‘Bassistry Arts’. I would like to especially thank our wonderful team of volunteers who regularly give so much for our children. You add a richness to the lives of the children you help. Particular thanks must be given to the staff who are leaving us this year. Mrs Dwyer, Miss Ashberry, Mr Vaughan, Mrs Spencer, and Mrs Seaward together, have influenced the lives of a generation of children from our school in their own inspirational ways. I know that they will be missed by the whole school community and we wish them every success for their futures. Finally I would like to thank all the children of whom I am so proud who have contributed so much to make sure that this has been another amazing year for Sir Robert Hitcham’s CEVAP School. I wish you all a very restful and enjoyable summer break. · For sessions at 3:10 parents should collect their children from the playground, and take them to the room detailed where they will watch a DVD while you go to the new class for the meeting. CLUBS THIS WEEK - The only club running will be Tennis (Tuesday). The Friends would like to thank everyone who supported and helped at the disco – it made a record £566 – which is fantastic. Also grateful thanks to those who baked or bought for the cake sale that CH & KM did last week. They raised a brilliant £165 another record! Well done! DEADLINE FOR PAYMENT IS MONDAY 7 SEPTEMBER, PLEASE. As there is no increase to school meal prices in September we are carrying over any Y3/4/5 dinner money overpayments. Refunds will be done for Nursery (those moving up) & Year 6. We have not yet scheduled all the clubs for the autumn and so will not be starting any until at least the week of 14 September – a club list will come out in September. Violin, Flute, Clarinet, Guitar and Music For Schools will start week commencing 7 September so please remember your instruments. Look out for invoices (being sent / emailed towards the end of the summer) for payment by 7 September. Thank you. Please can we remind parents to make sure the children come back in September with an art apron, they can get very messy! At the start of the new school year – if you currently volunteer, please make sure you speak to the teachers to offer your help with reading in the classes, thank you. Please can we ask that all parents sign up to ParentMail before September. All newsletters/music & club letters/trip letters/forms etc will come via ParentMail from September and not from the school email account or as a hardcopy. · You should have received an email or text from ParentMail asking you to register – if you haven’t please let the office know. · Please register both your email address and a mobile number on the system – but you only have to register once (either via the email or the text link). · There is no limit on the number of parents that can register, so it does not have to be just one per family. But please be aware if 2 parents register (with different email addresses) then both will receive emailed letters. · It is important that every family has mobile numbers registered on the system which we will be using to send texts for urgent items (usually) ie school emergency closures, clubs cancelled (this will be specific to the clubs your child is signed up to) etc. We will only be sending these urgent texts to the parent who is registered as Priority 1 on our system (as per the data sheets parents sign each year). If you have no mobile phone these urgent messages will be sent via email. If you have any technical problems with registering please contact ParentMail directly parent_support@parentmail.co.uk as the school will not be able to help on technical issues. Please be aware that they are busy as they have many new schools to deal with at this time of year, and may take a few days to respond. The Summer Reading Challenge is free and fun. It is designed to have maximum child appeal and is highly motivating. It is not a competition but a personal challenge within a particular time frame which offers reading inspiration and incentives to encourage children into libraries. The last day of term is this Wednesday 22 July. The children return to school on Thursday 3 September. With this letter please find the dates for the Introduction to the New Class / Teacher sessions for September. These 3 films show highlights from each term during the school year. We've had 3 fantastic cookery clubs with children from year 4, 5 and 6, cooking a variety of dishes like pancakes, burgers, fishcakes, pasta and of course the all time favourite cakes! Great fun was had by all and everybody enjoyed the preparing, cooking and tasting. Big thanks go to our wonderful teaching assistants - Mrs Jenkins, Miss Dineen and Mrs Skeggs for voluntarily running this club every week, without them we would not be able to offer this great opportunity for the children. Thanks also go to Mrs Cooper for supporting us in the background by arranging a sponsorship from Tesco so we can do exciting things in the new school year. Get cooking and baking in the summer holidays ready for the Master chef bake of in September. Thank you to the families of the Year 6 leavers who have kindly donated to the school libraries. Please could all parents sign up to ParentMail before September. · Parents should have received an email or text from ParentMail asking to register – if you haven’t please let the office know. · Please register both your email address and a mobile number on the system – but you only have to register once (either via the email or the text link). You can also download an app if you have a smart phone. · It is important that every family has mobile numbers registered on the system which we will be using to send texts for urgent items (usually) ie school emergency closures, clubs cancelled (this will be specific to the clubs your child is signed up to), changes to music lesson days (to bring instruments – again specific to those who have music lessons). We will only be sending these urgent texts to the parent who is registered as Priority 1 on our system (as per the data sheets parents sign each year) as all texts cost the school money. If you have no mobile phone these urgent messages will be sent via email. The books kindly donated by families of Year 6 leavers will be displayed by the hall towards the end of this week. Thank you so much for your contributions. Volunteers should come along to the hall on Thursday at 1.45pm for the Thank You Tea. THIS WEEK OF 13 July - there will be NO LUNCHTIME CLUBS & THE ONLY CLUBS RUNNING AFTER SCHOOL WILL BE Multisports (Mon), Cricket, Reading & Tennis (Tues) and Gym (Fri). This is the last week for County Music Service (Guitar, Brass, Flute & Clarinet). FINAL 3 DAYS OF TERM w/c 20 July - NO LUNCHTIME CLUBS & THE ONLY CLUB RUNNING AFTER SCHOOL WILL BE Tennis (Tuesday). Due to the response to this terms menu, EATS catering have taken on board comments from school kitchen teams and children and have re-vamped their menu for September. We are sending home a hard copy of this today via the oldest child in each family. Classes CH & KM will be baking for this cake stall on Friday in the Playground. Please remember to bring in some pocket money to buy a sweet treat! The Friends are delighted to say that their Race Night raced a brilliant £410, which is a fantastic amount given the number of parents who attended – thank you to all for your generosity. The afterschool cricket festival refreshments raised an excellent £60. Thank you to everyone who helped on the day. The school is funding Class Music lessons for all Year 4’s from September where pupils will be taught either a Brass instrument or the Clarinet. The children will have a weekly lesson throughout the school year and will be supplied with their own instrument to use at school and at home. In September we will be giving parents of Year 4’s a form to complete and return confirming your acceptance of the CMS terms and conditions of instrument loans. The Leavers’ Service will be held at St Michael’s Church on Monday 20 July in the morning at 9.30am. Year 6 parents are warmly welcomed to this event. Pupils in classes JA and ES will attend plus any other younger siblings of Year 6 children. Registration emails or texts have been sent from ParentMail now, so please look out for them so you can be registered ready to receive communications from September. Please see the office, by the end of the week, if you have not received a request to register. We are planning to hold ‘Masterchef’ Competition Cookery Club sessions in the Autumn Term for interested children in years 4,5 and 6. Why not get practicing over the holidays? Keep an eye out for more details in September. Due to our links with the Phoenix Singers we have been given a fabulous opportunity to see the National Youth Orchestra rehearse on Thursday 6 August in the afternoon at Snape Maltings. If your child is interested to go along (parents would need to take them to this), please leave your name and contact details with the office and we will confirm back to you. We will be involved in the festival at Snape in the autumn, taking part in some musical and poetry events, look out for more information in September. There have recently been a few outbreaks of head lice in school and we would ask that parents please take action to regularly check for head lice and take appropriate action to clear them if found. If everyone does this over the holidays we should be able to return to a head lice free school! We would also encourage that long hair is tied back in school as this is one way that may help to reduce the spread between children. We’re very excited to tell you that we have introduced a brand new itinerary, run across a number of Suffolk venues this summer holiday! Each day will provide a wide variety of sports that have not been offered previously to reinvigorate our holiday offer! to check for any items your child may have misplaced this term….It is really full!! We will be putting it on the playground on Friday, after which we will recycle any left items. Don’t forget… next week our last day of term is Wednesday 22 July. On Thursday we enjoyed a superb day at the coast - taking a boat trip to seal the seals at Blakeney Point. On the beach at Wells. T famous camp show was very entertaining this year. Playing baseball in our new tie dye t-shirts. The staff - what a team!